With freezing temps nightly, the many homeless on our DC streets need our help. Mayor Browser speaks of addressing this growing issue as one of immense importance. 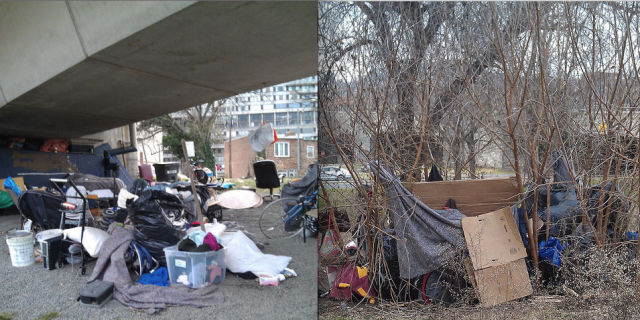 And yet, in the shadow of the Watergate bldgs there are growing encampments under and around the Whiteshurst freeway. Yes, these burgeoning camps are an unwelcome blight for all entering DC from Va on the Roosevelt bridge. But, more importantly they showcase how some in our prosperous, growing city are now stuck in an economic downward spiral. As I was photographing one encampment I was able to talk to a father and his female companion along with his grown son and a female friend. I told them I’d send these photographs to ms. Bowser to alert her to their situation. I’m hopeful we can help some of those on the streets of DC these cold winter nights as more of us send our concerns to the mayor’s office. “The District of Columbia is committed to protecting the homeless from extreme weather injury by meeting the demand for shelter during hypothermia (not enough heat) and hyperthermia (too much heat) seasons. The District’s Winter Plan for homeless services went into effect on November 1. When the temperature falls below 32° Fahrenheit between November 1 and March 31, all people who are homeless must be housed. You can help. Call the Shelter Hotline when you see a person who is homeless who may be impacted by extreme temperatures. Families seeking emergency shelter should go to the Virginia Williams Family Resource Center at 920 Rhode Island Avenue, NE. The shelter operates between the hours of 8 am and 3:30 pm, Monday through Friday (except for holidays and days on which the District government is closed). After 3:30 pm and on weekends, during extrene temperature alerts, families should call the Shelter Hotline for transportation to the DC General family shelter or other available family shelter. Some of the severe weather shelters operate from 7 pm to 7 am during extreme temperature alerts only. Other single adult hypothermia and hyperthermia beds will also be available 7 pm to 7 am. These shelters open at the time of the first alert of the season and remain open every day of the extreme temperature season. These are seasonal shelters. “Mayor Muriel Bowser is activating the city’s Cold Emergency Plan, to take effect this evening and through the early morning hours of Friday, January 9, in anticipation of frigid weather over the coming days. Officials at the District’s Homeland Security and Emergency Management Agency (HSEMA) have informed the Mayor that conditions exist that require the plan to be activated at 9:00 pm this evening. A Cold Emergency Alert is issued whenever the actual or forecasted temperature, including the wind chill factor, falls to 15˚F or to 20˚F with precipitation. HSEMA, the Department of Human Services (DHS) and other city agencies have determined that the weather as forecast presents a danger to people out in the cold. By activating the Cold Emergency Plan, Mayor Bowser authorizes the District to implement additional measures beyond traditional sheltering, such as warming sites, to keep residents who are homeless warm and safe. “Tonight and tomorrow we are expecting temperatures to drop to as low as the mid-teens. Temperatures that cold can be dangerous for many of our friends and neighbors, including seniors, the homeless and less fortunate residents who may lack adequate heating or clothing. The District has the resources to keep our residents safe and secure. Activating our Cold Emergency Plan allows the city government to deliver vital services to residents when and where they need it most,” said Mayor Bowser. Individuals who are homeless should request transportation to a shelter or warming site by calling the Shelter Hotline at 202-399-7093, 211 or 311, or toll free from a payphone at 1-800-535-7252.